I’ve been living in New York for over two years now, which as a Peruvian, adds up to approximately 800 days of living with the constant threat of thirst. Because it’s not easy to find Peruvian pisco in New York. And it’s even more difficult to find the kind of Peruvian piscos that move you. In this city with its thousands of bars, in which some touch the sky while others are swallowed by the earth, thirst is, in fact, a reality as daunting as a half empty glass. One night, when I was still a newcomer to the city, I remember catching a glimpse of the typical tall-necked bottle shape of the Viejo Tonel pisco, in the darkness of a Brooklyn bar where Latin bands play. But my excitement lasted even less than the shot: The bartender poured the last drops from the bottle for me, telling me I was the only person who had ordered pisco in months. On another occasion, when I was visiting at a Cuban friend’s house in New Jersey, he asked me if I could make him a chilcano –a popular pisco and ginger ale cocktail. He told me there was a nearby liquor store that sold pisco. We went and my joy turned into a hard-to-hide disappointment when I realized that the store only had pisco made in Chile and that they didn’t even know that there was such a thing as Peruvian pisco. Although my friend was quite aware of the continent’s geopolitics, I had to explain the reasons for my disappointment to him. Because whenever you talk about pisco, history can’t be avoided, I gave him an executive summary that goes something like this: Since the 1879 war between Peru and Chile, overwhelmingly won by the latter, there has always been a bitter rivalry between the two, regardless of what the issue might be–pisco, for example. In this respect, Peru lays claim to both the creation and the designation of origin for this grape brandy. Historically, the port of Pisco --which is in Peru and which gives the drink its name because, among other reasons, it has been shipped from there to different parts of the world since the Spanish colonial days--has solidly supported the Peruvian position. Moreover, Chile, if not the greatest, is one of the largest importers of Peruvian pisco, which is in and of itself a recognition of its quality. Nevertheless, the pisco scene in New York is changing, according to various media, including The New York Times, which devoted an article to the new Peruvian pisco brands that are gaining market share in this country. But as significant as it is to be able to find pisco in Manhattan’s large liquor stores, such as Astor Wines & Spirits (www.astorwines.com), is being able to find it in the battlefield –that is, in places where spirits are actually put to the test through conversation. I’m referring to the bars and, in this sense, pisco has received a major boost in New York thanks to an initiative anchored by the Pio Pio restaurant chain. The results of Pio Pio’s pisco bar were promising, so Milligan and Mayor decided that as part of the Pio Pio restaurant chain, it would be a good time to open (and, here, a drum roll would be in order) Amaru –-the first pisco bar in New York. Located in Jackson Heights, Queens, a neighborhood made up of low buildings, wide streets and a massive and international Latino presence, Amaru looks like a trendy bar that could easily be located in Manhattan. To my surprise, the site’s design doesn’t resemble either the atmosphere of pisco bodegas or anything directly Peruvian. In fact, the only clue we might find about the bar’s Peruvian roots is its name. Amaru means snake in Quechua and is a word that is very much in the Peruvian imaginary because of Tupac Amaru II, the leader of the greatest indigenous uprising against the Spanish crown in 1780 –Didn’t I say that it’s impossible to avoid talking about history?-- His name means fire serpent and has been adopted as an icon for various political and artistic causes in Peru, although his aura has transcended national borders. In the U.S., the popular rapper and actor Tupac [Amaru] Shakur took this revolutionary’s name, and now Queens has a bar with his name too. The seemingly cold ambience at Amaru disappears as soon as you taste its cocktails and appetizers. Obviously, there’s pisco sour, chilcano and passion fruit sour, a particularly refreshing variant of the pisco sour, but there are original cocktails too. The appetizers range from ceviches through salchipapas, and include Spanish tapas. All of it responds to the concept Rodolfo Mayor and Alejandro Miligan wanted to establish. The project began three years ago, when Mayor and Milligan went to Peru with the idea of collecting information to support Pio Pio’s new pisco theme. For this, they subjected themselves to the unspeakable sacrifice of visiting the best pisco bars in Lima. Among the bars they visited were Las Brujas del Cachiche, La Calesa, as well as historic bars like the Hotel Maury bar, the Hotel Bolivar bar and the Bar Inglés at the Country Club hotel. They talked to managers and bartenders --they were particularly impressed with Roberto Melendez, the extraordinary bartender at Bar Inglés –picking up suggestions and taking notes on recipes. Looking for the perfect pisco sour, they discovered that that discussion can take on philosophical dimensions: is perfection humanly possible? Is it necessary? With a blender or a shaker? With sugar or syrup? “No one follows the original recipe. Each bartender has his own version,” Mayor understood. 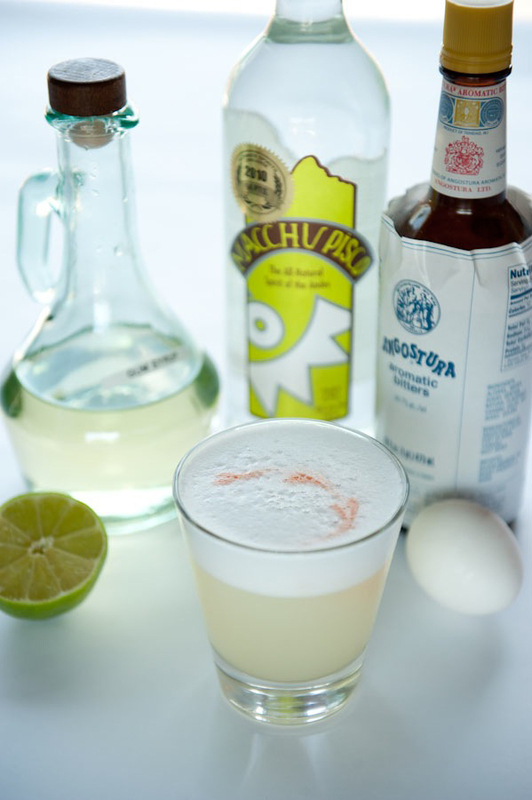 “But I liked the pisco sour at La Calesa the most. The bartender uses two ounces of pisco instead of three, which is the original recipe. And maybe that’s why I liked it best. In New York, I’m used to drinks that only have two ounces. Three seems more aggressive,” he explains. In terms of the outlook for pisco in the city, Mayor sums it up like this: “Some years ago, there wasn’t much variety of pisco in New York: There was Ocucaje, Vargas and Barsol, and Macchu Pisco had just entered the market. The rest was Chilean. I would call the distributors and they wouldn’t even know the Peruvian pisco. It has evolved a lot over the past two years. Pisco 100 came out. Barsol just released an Italian mosto verde and Porton, a “mosto verde acholado”. Biondi has brought three of his piscos. Vargas brought two piscos and two mosto verdes. And Macchu Pisco has La Diablada and La Ñusta will be coming soon. And there are others coming. Viñas de Oro in San Francisco has its entire line. We’ve heard they’ll be coming here soon. And, Campo de Encanto is here too. The market is growing,“ Mayor summarizes. And what’s the goal? We asked Rodolfo Mayor. “Fifteen years ago, you went to a liquor store and the only tequila available was Jose Cuervo. It was highly sought at the time. Now you read Beverage Media, the guide for liquor coming to the United States, and you can find endless number of tequilas, and many of them are spectacular. And the same goes for mezcal. This is our competition. People come and ask, ‘what is pisco; is it, a tequila?’ ‘No,’ we have to explain. If we do it well, pisco will grow like tequila has grown,” says Mayor. “The ideal would be to have pisco in every bar. Every bartender should always have a gin, a rum, a vodka, a tequila and a triplesec. The idea is to also have a pisco, because he knows that people will order it.” Milligan concludes. As we speak on a raised platform of Amaru, I start to end the evening with a shot of La Diablada, a pisco I was introduced to in Lima several years ago and of which I have good memories. La Diablada, which is a pisco produced by the Asher sisters, is not a pure pisco; that is, it’s not distilled from one grape alone. Instead, it’s an acholado –which means mixed, blended. Johnnie Walker whiskeys, both red and black, for example, are blended, while the green “pure malt,” is pure. The acholado can be a way to use grapes that are insufficient to complete production of pure, but it could also represent a pisco maker’s way of showing how perfect his pisco is. Why is it called acholado? To explain the word cholo is almost like trying to explain the entire history of Peru. I’m not going to try it here, but I will provide a brief summary: Cholo is a word used by whites to refer negatively to indigenous people, usually in urban settings. ‘Cholear’ is a racist exercise, because it places one race over another and it is especially absurd because in Peru we are all racially mixed . But cholo, chola, cholito, cholita, can also be very affectionate words, that we use with people with whom we have more intimacy: lovers, friends and family. And in recent decades, the word “cholo” has acquired a militantly positive connotation when people who use the word recognize that everything Peruvian is cholo and therein lies the difference that makes it unique and special. Then, cholo means everything: good, evil, hate, love, past and future. Did I already say it? To talk about pisco is to talk about Peru. And that reminds me of my Cuban friend and I think that Amaru would be an excellent place to get rid of that geopolitical-alcoholic nail. And I also think that now, to a Peruvian pisquero in New York, the glass will never again be half empty, but half full. And indeed, I want mine filled up again.